It's been a hectic couple of days. Arrived tuesday, a quick dinner at Papparazzi's on Douglas front, then across to Peel. Out with friends and unfortunately didn't roll in until nearly 2am, so the plan to get up early and put in a quick western 10 before my 11am massage was hastily changed. it was windy and raining so down to a quick 5 mile warm up, (in the wind, a great hangover cure) then off to see Dawne to get all the knots and kinks out. She quickly found the cause of my hamstring pain as a badly knotted muscle which she told me the name of and I immediately forgot, which was pressing againstthe sciatic nerve in the right buttock, and manifesting itself as hamstring pain. Lots of twisting and pain, but it seems to have eased greatly. It shows the importance of stretching if you're out walking any kinds of distance, pre and post stretching keeps you flexible and gives more protection against injuries. Back for a quick lunch, and lots of water, then it was Peel to Douglas, 10.5 miles, pushed on and completed in 1hr 59m, with no sciatic reaction. 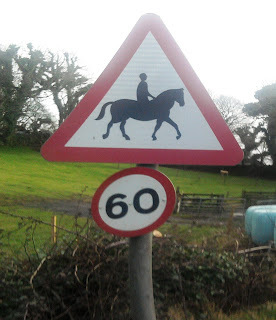 Saw this approaching Ballacraine from the north, the Island must have some quick horses if they have to be restricted to 60mph! In the evening it was off to the Welbeck for a bite to eat with Bernie, and finally get rid of her trophy I'd been carrying around for 5 days! It had a big lump of marble and was quite a weight, but she was pleased to recieve it, and manx radio were there for an interview, which will be aired on 23rd February at 6.05pm. Just Bernie and myself (mainly myself, I'm afraid, Guinness tends to loosen my tongue!) waffling on for ten minutes or so. At the moment it's severe gales and lashing rain, and I have the morning free, so off to Rushen to do the sloc sounds like it might not happen, although if the wind stays from the south west It'll be behind me so just wrap up and enjoy it. I don't like the wind because it blows around my ears and so I can't hear my MP3 player. Anyway, off out again, a couple of the pubs in Peel have sent out an appeal because the bars are in danger of collapsing, so they need some lads to go and prop them up... That's my excuse anyway.